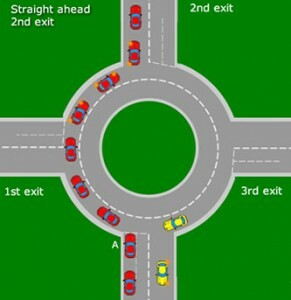 During driving lessons and the driving test, you will come across roundabouts. There are various types of roundabouts from small mini roundabouts to large complex multi lane roundabouts. 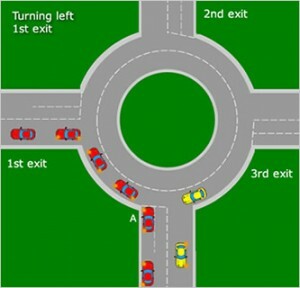 The roundabout shown on this page demonstrates a typical roundabout you will most likely encounter during your driving test. 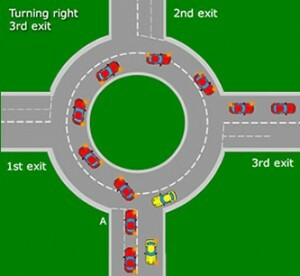 During the driving test, the examiner will give directions such as “At the roundabout, please turn left first exit”. On the approach to a roundabout use the MSPSL routine. This stands for Mirror, Signal, Position, Speed and Look. As you are turning left first exit, you will need to first look into your interior mirror followed by your left mirror and then indicate to the left. Your car will need to be positioned in the left lane and generally slow down and approach the roundabout in second gear. If the roundabout is large and the view is clear, approaching the roundabout a little faster in third gear may be more appropriate. Use appropriate observations on the approach of a roundabout as early as possible. You will need to give way to vehicles approaching from the right. Many learners tend to focus their observation to much to the right and not enough on where they are going. Quickly alternate observations from the direction the car is traveling and to the right. This will ensure you will stay in the left lane and not cut across the roundabout. Either stop your car at position A or if all clear continue round using the left lane. On the exit road ensure you cancel your indicator if it stays on. Roundabouts can be daunting for learner drivers as it is not always clear when to stop or proceed. Approaching roundabouts slowly provides you with enough time to keep in your lane but to also take effective observations. Becoming confident with roundabouts takes practice. As you become more skilled with clutch control you will be able to move away briskly. Until you gain confidence with the clutch, when you are waiting at a roundabout for a chance to go, using the clutches bite point will enable you to move off in a timely manour. During the driving test the examiner will ask you to “Follow the road ahead, 2nd exit”. Use the MSPSL routine. Take a look in your interior mirror as you will be slowing down or stopping. Often the left lane is used to going straight at roundabouts, although you will need to look out for road signs and road markings incase it is a different lane required. You will not need to signal as you are going straight. Take effective observation early as possible, slow down and select second gear. Stop in position A if a car approaches from the right. When all clear, move off keeping in the left lane. Once you have just passed the first exit, take a look in your interior mirror and then your left mirror and indicate to the left. By indicating left here, you are telling other road users that you are taking the next exit. Once you have taken the exit, ensure your indicator has stopped or cancel it if required. Looking well ahead during driving lessons and the driving test for signs and road markings will enable you to think well in advance what procedure you will need to take. Many driving tests are failed due to not being prepared for a given situation. If you stumble onto a roundabout unprepared you are likely to make mistakes. Looking well ahead and planing what you need to do is the key to passing the driving test. This will enable you to approach the roundabout at an appropriate speed. Treat a roundabout as you would a T-junction. If it is closed and you can see very little, you will need to approach very slowly, possibly in first gear. If it is open and clear you can approach faster in second or third gear. The examiner will ask you to “at the roundabout please turn right. 3rd exit.” Of course if it is the independent part of the driving test, you will need to rely on road signs and a destination given by the examiner. During the independent driving part of the test, the examiner will not tell you which exit you will need to take. Use the MSPSL routine. Take a look into your interior mirror, your right mirror and indicate to the right. Select the right hand lane, slow the car down and select 2nd gear. Stop in position A if required to give way to anything from the right. When all clear, move off keeping to the right hand lane or inside lane as it is also referred to. Just as you pass the 2nd exit, look into your interior mirror, your left mirror and indicate to the left. Gently move over to the left lane and proceed to the third exit. Again ensure your indicator has stopped.